Artist David Guinn’s design features rowhouses and lots of color. It will be painted on a wall at Cottman and Frankford. 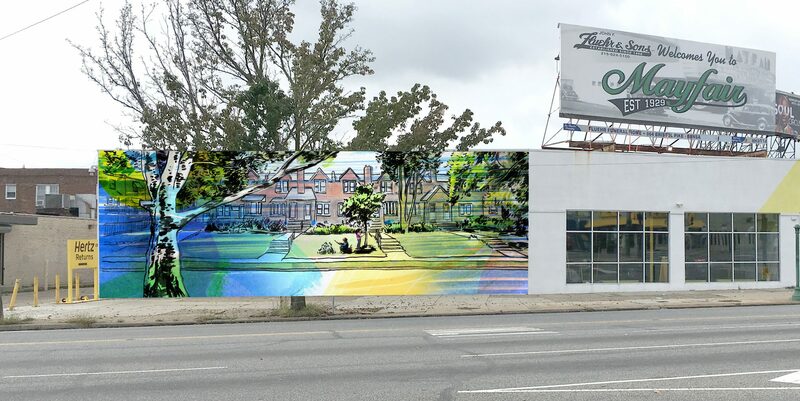 In a matter of weeks, Cottman and Frankford avenues will be home to a colorful new mural paying homage to Mayfair’s rowhomes. Officials recently unveiled the design for the mural, which will be painted at the southeastern corner of the intersection on the wall next to Hertz. It’s modeled off a nearby block on Guilford Street and features a large tree in the foreground and kids playing near a newly planted tree. The entire scene is veiled in an array of colors. Artist David Guinn, of South Philadelphia, designed the mural, and he will paint it. He said he wanted to capture everyday life in Mayfair and catch the eye of those passing through the neighborhood. Murals used to be linked with urban blight and associated with poorer neighborhoods, but it appears the tide is changing. Marc Collazzo, of the Mayfair Business Improvement District, which has been spearheading the project, said he believes an artistic renaissance among young people may be responsible for the growing interest in murals. “It’s almost a way of signaling out your neighborhood in a good way, that you have something that some other places don’t,” he said. Plans remain on the table for murals at the Veterans Multi-Service Center Thrift Shop, 7126 Frankford Ave., and at the ShopRite at Frankford and Knorr Street. However, those projects are still in their early stages, Collazzo said. At the Mayfair Civic Association’s September meeting, residents seemed supportive of the mural at Cottman and Frankford, and some suggested other locations for future projects. Collazzo said Guinn’s mural will turn an otherwise blank white wall into “an explosion of color and life.” He also thinks it will show that the neighborhood is going in a positive direction. The mural is being funded by the Philadelphia Mural Arts Program and Sixth District Councilman Bobby Henon’s Office. A community paint day will be held Saturday, March 23, from noon to 2 p.m. at the Mayfair Community Center, St. Vincent and Battersby streets. Residents will be invited to see the design and paint it themselves on large 5-by-5-feet pieces of fabric. “It’s a way to involve everybody before David starts to paint the mural,” Collazzo said. Guinn said he expects to start working on the project around the time of the paint day. It’s not a long process, he said, and the goal is to have the mural completed by the end of April. Perhaps the most difficult part of a mural is coming up with a design and reaching a consensus with the community, Guinn said. 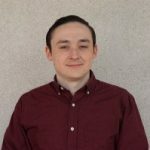 Guinn, a Central High School graduate, remembers traveling to Mayfair to visit his great aunt or to hang out with friends, but, beyond that, he didn’t have much experience in the neighborhood. Collazzo took him on a tour of Frankford Avenue and introduced him to some business owners. He also spent time walking and driving around the area. “I guess what I learned is there’s a lot of different communities in Mayfair,” Guinn said. Guinn said he tried to use traditional and modern elements in the design to signify the old and new of the neighborhood.